Its meals are poisonous and stink to high heaven, but when you’re a 2-centimeter-long worm living in the Mediterranean Sea, beggars can’t exactly be choosers. Dubbed olavius algarvensis, the aquatic animal lives in sediment off the coast of Italy and relies on noxious gases like carbon monoxide and hydrogen sulfide – the latter of which reeks of rotten eggs – for sustenance. Both gases can be deadly to humans. Weirder still is that the wriggly little invertebrate lacks a mouth and stomach entirely. “Olavius algarvensis has completely reduced its digestive system. Instead, it relies for all its nutrition on symbiotic bacteria, which live under the outer body wall of the worm,” said Manuel Kleiner, a Ph.D. student and researcher at Germany’s Max Planck Institute for Marine Microbiology. Chemosynthetic bacteria under its skin produce nourishment by absorbing the gases in the water and converting them into energy via a process similar to photosynthesis. In environments as void of nutrients and sunlight as the deep sea, such bacteria have specialized in procuring organic matter from carbon through the oxidation of inorganic molecules such as sulfide, rather than sunlight, as an energy source. Scientists have long marveled at the worm’s ability to survive in the nutrient-bare depths of the Mediterranean Sea but were until now aware only of its hydrogen sulfide consumption. 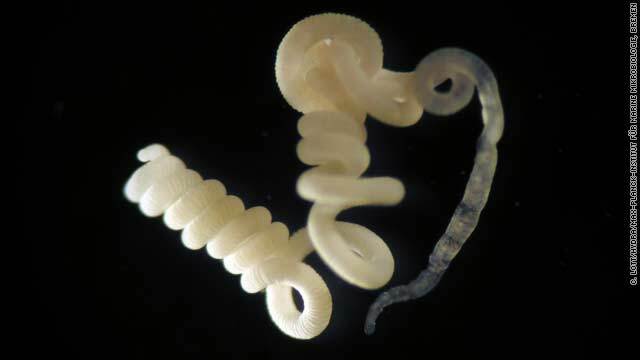 Recently, however, Kleiner and a team of researchers from Germany, Italy, the United Kingdom and the United States discovered that the worm and its bacteria had a number of bows in their quiver, including deriving energy from carbon monoxide – a molecule they didn’t expect to find in the sandy sediment near the Elba coast – and from any byproducts. They published their findings this month in the American journal Proceedings of the National Academy of Science. But as pivotal to the worm’s survival as this symbiotic relationship is, it has led to some fairly curious evolutionary side effects. The worm has overcome its need for digestive organs, for example, both internal and external. Sure, this ensures that no morsel of the foul-smelling fodder goes to waste, but it also means the worm puts to use its own excrement. Interestingly, the researchers have identified the same kinds of metabolic pathways – or sequences of chemical reactions in living organisms – that are present in plants and algae. However, because of a “modification” in the bacteria’s pathway, it is much more energy-efficient. “One could speculate that in the future one could use genetic engineering methods to transfer this pathway to algae or plants to increase productivity,” Kleiner said, pointing out that such a find would prove especially useful in fields of bioenergy research, where crops could be trained to grow in low-light conditions, for example.